Who can tell me more about the 47th BB? Attached is the picture of the 47th Dundee B.B. Pipe Band, as you requested. I'm sorry it is not bigger or clearer. 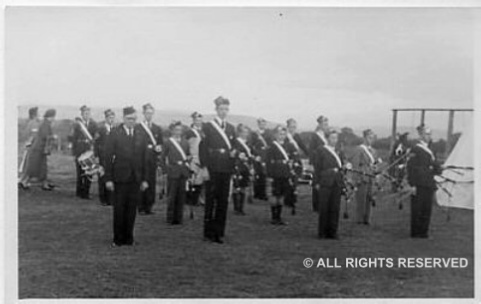 I can't give too much in the way of ID's other than the tall piper front row right side is Jimmy Somerville, and the officer standing next to him could be Jock Carstairs, who was the piper tutor for quite a while. I am the lead snare drummer visible in the last row, right, and the bass drummer is Ian Murray. I think some of the others are as follows: front row extreme left, last name M'Glashan, behind him Jack Cunningham, and behind him Stan Waddell. The piper second row centre is Stewart Bowman. The drummer visible between the two pipers in short pants is George Stewart, I'm fairly certain, and the last name of the tenor drummer in front of him was Hugh Price. I'll forward them to you.